Please note that the content of this book primarily consists of articles available from Wikipedia or other free sources online. "It's The Sun Wot Won It" is a famous headline that appeared on the front-page of The Sun on Saturday 11 April 1992, and has since become a political catch phrase in the United Kingdom. 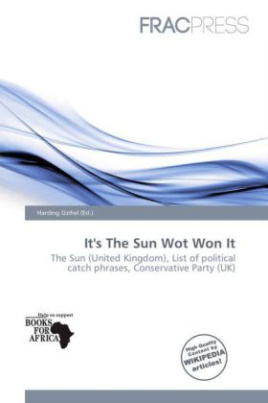 The headline referred to The Sun's contribution to the unexpected Conservative victory in the 1992 general election. What influence the newspaper had on voters in the narrow Conservative victory is unclear, but in the leading up to polling day, the newspaper led a campaign against the Labour Party leader, Neil Kinnock, which culminated in the election day headline, "If Kinnock wins today will the last person to leave Britain please turn out the lights".